Thinning hair? No Ouai. This super supplement breathes life into dull, dry strands with a powerful punch of biotin, silica and amino acids, feeding follicles with intensely hydrating nutrients. 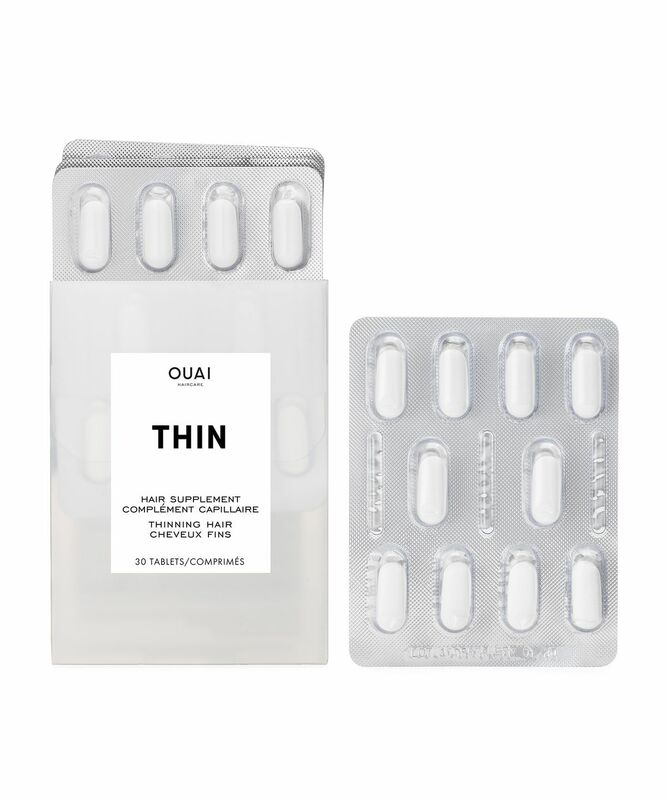 Delivered in a convenient tablet, one a day will promote healthy, shiny hair, prevent breakage and restore shine. 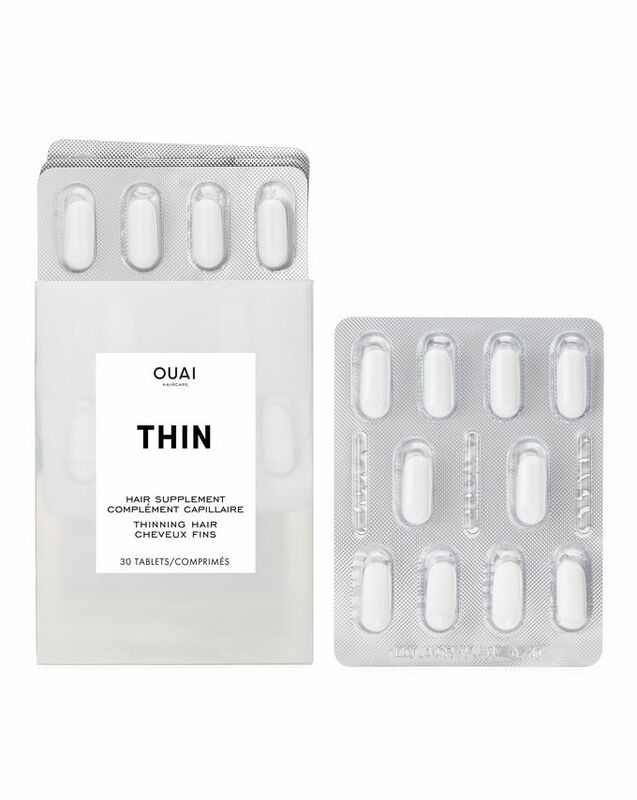 If your hair’s losing volume and it’s got you feeling flat, Ouai’s Thinning Hair Supplement is exactly what you need to restore va va voom to your scalp, strands – and spirit! 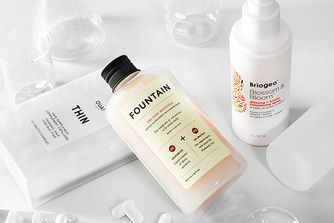 Featuring a powerful punch of biotin (to accelerate natural hair growth), MSM (a sulphur-based compound), ashwagandha (to reduce the stress hormone cortisol), amino acids (to boost keratin production) and omega 3 and 6 (to increase radiance), the tablets deliver a daily dose of intensely hydrating nutrients to the follicle, helping to promote healthy hair while preventing breakage and restoring sine. Suitable for men and women, this is the perfect antidote to thinning, ageing and stressed-out tresses – as well as a lifeline after an unfortunate haircut. You can expect stronger, longer and thicker strands after 90 days of daily use. I have damaged -colored hairs and i found visible results after 15 days. Totally recommend it. I took them for 3 months after my baby was born and I started shedding like a golden retriever. They worked magic and I have loads of new baby hairs now! It is the second time that I have started a 3-month course. It looks like I will be using it every time my hair loss begins. After the first month, there were hardly any hairs left on the brush or in bathroom, from the 2nd month new hairs started growing so fast that at times my head becomes itchy. This did absolutely nothing. Also very poor quality of the tablets, no joy to use. If anything I felt my hair was more “straw like”. Not dry by any means but very unstructured. If you want something to help with volume, try the Inneov Volume tablets - just amazing! And I live the Briogeo Volume line. Best combination ever, so many compliments! I'm two days away from finishing my first box and I'm already noticing hair regrowth on my post baby bald patches. My paediatrician looked at the ingredient list and said it would not affect my milk supply. Happy with the purchase and about to reorder them. I’ve always had thin hair which has recently thinned out worse due to stress. Have just finished my second pack of these and can’t say I’ve really noticed any difference. Might have been a slight improvement at first but after two months I wouldn’t say it’s particularly gotten any thicker. Не ожидала что будет эффект от приема БАДов, но волосы стали расти быстрее, и действительно, стали толще, а так же это коснулось и ногтей. *** It’s so amazing! I can’t believe that you can see the effect of supplements. My hair grows instantly and grows thicker. Also my nails have become stronger. Few months ago I've decided to let my hair grow so I can donate it for making wigs for cancer patients. In general I have thick hair but as I let it grow it became very dry and started thinning and falling out. I've used this supplement that made the biggest difference in my hair journey! After just 2 weeks I got my hair back to normal! I didn't see result for one week and I was thinking that it is just another fad pill but I believe you have to let it build up in your body so don't give up! I’ve been experiencing massive hair loss and thinning in the past months due to stress, moving to a different country, home and all of what that involves. I was getting super worried about my hair. Taking this supplemnts is a total help and support for my hair. I can feel the difference is only 2 weeks. I highly recommend it if you want to boost your thin hair! I've been using it for the last 3 months, I've noticed that my baby hair has grown and my hair, in general, seems thicker! But what I most loved is that my lashes have grown as well. I don't even use mascara on daily basis now as I used to do that before. So far so good my hair seems thicker but this has not stopped my hair loss in the shower/brushing etc be aware that the tablets make your urine luminous it freaked me out and I had to google to ensure it was normal- something to do with vitamins! I have been using these tablets for 3 months now. I can honestly say my hair feels a lot stronger and healthier, even my hairdresser noticed. I haven't noticed an increase in hair growth, as I was hoping I would have long healthy hair. They must be working as my eyebrows (especially) and underarm hair (which I had laser removed) have both started growing a lot more. I used to have very dry ends, that no hair mask was able to get rid of, and my hair was shedding a lot. Since taking this supplements dry ends disappeared completely, I stopped loosing my hair everywhere and it is silky and shiny. Although it didn't make my hair grow longer or fuller, I'm still very happy with the results. I tried this with my mum and we have different results. I couldn't tell if this is working for me so I doubled the dosage (wouldn't recommend doing so) and started losing less hair in the shower. Based on my experience I would probably give it 1 star maybe 2. Different story for my mum, she has got no eyebrows. After taking this supplement for less than a month (1 pill a day), she started growing eyebrows, which is unbelievable! She's 61 btw. So I'm rating this product based on my mum's results. When I had a stage of abnormal hair shedding due to hormonal changes I was at my wit's end trying to find something to help! I tried sprays, shampoo's, lotions, treatments and other kinds of hair supplements but nothing made a huge difference. Any shampoo's and conditioner that claims to combat hair shedding just detangle your hair so less breakage occurs when you comb your hair. It is a quick fix but left the texture of my hair flat and greasy! This supplement is amazing!!! it has reduced my shedding very quickly. It has given me confidence that things are improving and reduced my anxiety about my hair hugely. NEVER discontinue this product!!! Thank you so much Ouai. I really wanted to like this product. I had heard so much about this and I was really looking forward to trying it out. Please beware that some people can develop side effects. I tried the supplements for one week and I had severe diarrhoea and stomach cramps. I wish that there was some kind of warning on the packet. After some researching, I figured out, biotin can cause diarrhoea in some people. Guess I was the unlucky one. I rarely believe in 'miracle supplements' but after seeing my fine hair getting even thinner than last year, I just went for it. Besides using the Ouai Volume shampoo, I took this every day for a month. I got compliments on having tons of new hair in only 2 weeks. I couldn't be happier and satisfied with this product. Wholeheartedly recommend it.This stuff works. Repurchasing on repeat. My hair seems fuller & healthier but I regularly do hot oil treatments at home with castor, almond and coconut oil. So, I have experienced hair thinning after having my first baby and then more thinning due to use of a copper coil (one of the side effects) and then more heat damage because I am always styling my hair to look half decent! These pills have slowed the thinning, when I run my hands through my hair they feel thick and a little bit more strong than usual. So purchasing again. But disclaimer - I do use a lot of coconut hair oil, take omega 3 supplements so perhaps all of these things are working together. This does work, really well, but I did not see any visible results until I started my 2nd box, so be patient. My fair is naturally thin, straight, and it has a lot of damage, I'm now ordering box #4, this has made my hair thicker and my nails stronger, I use in combination with Briogeo scalp line, I love it. Worth every penny. I didn’t see any benefits. I am always a bit sceptical about supplements like this however I was getting soo much hair fall out in the shower recently (maybe 70-100 strands) that I knew I had to take action. I started these two weeks ago today and I can tell you that my hair has stopped falling in the shower - like, completely stopped. I've been lucky and not had any acne or side effects from these (yet) so I plan to keep taking them for the foreseeable! Definitely worth a try if you're worried about fall out. I was taking these for about 7 weeks. The first 30 days were fine I was happy with the progress in hair growth and the quality of my hair and nails. Then I started getting really bad hormonal type acne all over my face and neck, big angry lumps that I would never normally get in random places I would never normally break out in. I persisted because I desperately wanted long hair until I realised these were the cause and the acne would only get worse and worse the more I took. I think they do support hair growth but this is what happened to me so I wouldn't recommend unless you know your skin won't react as mine did. I bought one pack after reading some good reviews. Initially I was a little disappointed, as I couldn't see any evidence of improvement. However, after taking my second to last pill, I finally noticed quite a few baby hairs had grown! I Intend to buy another pack and commit to it a little more, and see what happens in a few months. I feel that these supplements are beneficial. Have so far been using for 3 months and I think my hair seems a little stronger. The main improvement is seen in my nails...they are stronger and not as brittle! I will continue with the supplements and assess the long-term condition of my fine hair. First hair vitamins that don’t smell weird. Experiencing less thinning and less hair loss. Just finished my first 30 tablets and I've seen already the difference in my hair shedding whether during shower, brushing, or random hair shedding during the day. Ordered my second batch and definitely continuing! I want to believe ..
.. but after 3 months of use I have seen absolutely no difference in my hair thickness or quality. So disappointing. I've tried so many supplements and none really worked. But with this one I've seen results from the first month of use, my hair got much thicker and stronger. These made me break out in really painful cystic acne. A shame I couldn't take them long enough to see results. The best hair supplement I've ever tried in my entire life. I have naturally extremely thin damaged hair that I kept losing all the time. Since I started my 30 days journey with this tablets, it was a huge change! After a week the hair stopped falling down, after two it became much shinier and look healthier, a month passed, and my hair became much more attractive, stronger and firm. Even my hairdresser saw a huge difference! Now it's going to be my everyday routine, for sure! The high price tag kinda put me off at first but I gave it a shot after trying a lot of other supplements over the last few years and this one actually works!! I noticed a difference after about two weeks in and even my hairdresser noticed the improvement. Unfortunately, I have PCOS which causes hair loss in my case. Over the last 20 years, I tried almost every single product for my hair loss. (Sprays, supplements, oils...) this one is the only one which helps me. I do not know if my hair will ever grow back as it used to be but what I know is I lose less hair every day. Hope they will never ever stop to make this pills. THANK YOU, Jen for making a great product for us women who are suffering from hair loss and THANK YOU cult beauty for sending them to us who are living all over the world. Took these for a month and noticed a big difference, not only did it help with hair growth, it also made my acne disappear. Will definitely re-purchasing. Been taking these for 3 weeks now but i can certainly say they work i was having a heap load of hair fall out and its suddenly stopped falling. Also have thinning on scalp which is slowly improving. Will be purchasing again.